IBH Executive was created in order to find a more analytical and successful approach to search and selection within its key sectors. IBH Executive represents a transparent approach to the business of search and selection. The company is divided into the following practices: Finance, Accounting, Tax and Transfer Pricing. This clear focus enables us to deliver a truly distinct service built around a genuine understanding of our markets and an unrivalled international knowledge base. IBH recruits executives from middle management to board level for appointments within these three distinct verticals. 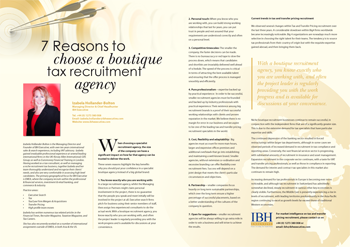 Managing Director at IBH Executive has over ten years international sales & search including VAT advisory experience. Recruitment experience was gained at several leading international firms in the UK: Kinsey Allen International, GRS Group and also at Euromoney Financial Training in London. The main geographical focus for IBH Executive is EMEA where the company recruits within professional & financial services, investment & retail banking, and commerce & industry. Izabela has written several tax related articles in the International Tax Review Magazine, Financial Times, Recruiter Magazine, Taxation Magazine, and Tax Careers. Our publication in the International Tax Review Magazine can provide you with additional information. Head of Tax – US Law Firm – Hungary.